For six years, a particular group of workers employed through contracts with the city, and filling important roles, saw their wages stagnate. In May of this year, however, Mayor de Blasio announced that his Executive Budget for the 2016 fiscal year, beginning July 1, 2015, would provide a 2.5 percent cost-of-living adjustment increase and an $11.50 per hour wage floor for some of New York City's human services providers - workers who staff senior centers, homeless shelters, foster care agencies, and more. 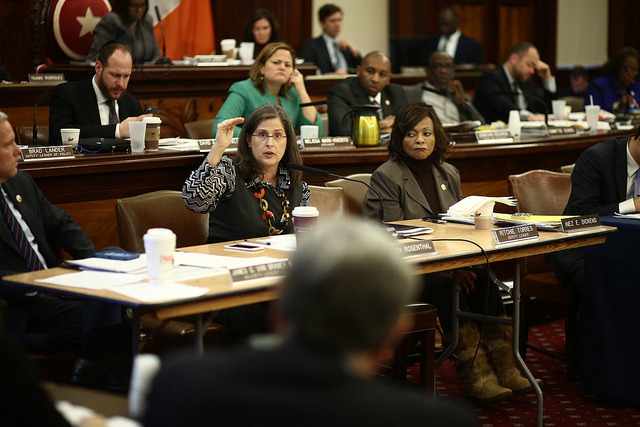 Though the wage adjustments have been hailed as a much-needed step and heralded as part of the mayor’s equity agenda, an upcoming City Council oversight hearing will explore the process for implementing them and ways in which wages can be raised even further. On Monday morning, Council members and advocates intend to discuss ways to raise the wages of a human services workforce that is increasingly in need of the types of provisions and programs - such as food stamps - that they help provide for others. 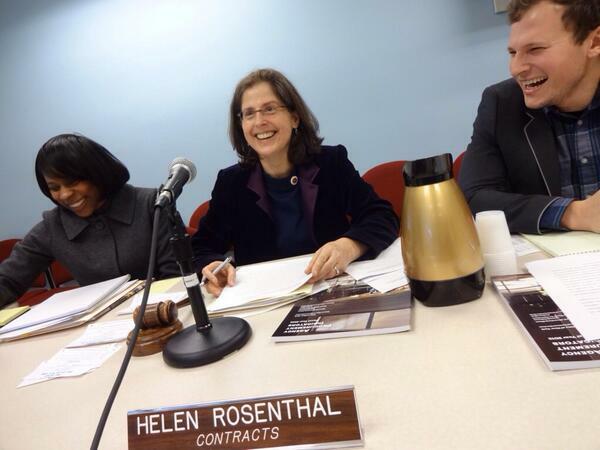 One aspect of this is ensuring that the mayor’s promise materializes, part of the impetus behind the hearing, according to Contracts Committee Chair Helen Rosenthal, one of two City Council members who will preside over the hearing - which comes five months after de Blasio’s announcement. Previewing the hearing, Rosenthal told Gotham Gazette, “It’s truly an opportunity for the administration to explain how they’re implementing this policy goal and I think we’ll learn a lot of critical details and answers to questions we've been asking for the last few months." Mayoral spokesperson Amy Spitalnick told Gotham Gazette in a statement that "The City is actively working with the non-profit service provider community and the appropriate City agencies to ensure that implementation covers all the intended employees and programs, and that it is done in an efficient manner that doesn’t place any undue burden on providers. It will be retroactive to July 1." Human services nonprofit organizations, which employ these workers and contract with the city, have seen years of cuts in funding. The wage floor and cost of living adjustment announced by de Blasio came much to the relief of the sector’s many low-wage workers, Michelle Jackson, associate director and general counsel of the Human Services Council, a coalition of nonprofit human service providers, told Gotham Gazette. "Our workforce has been chronically underfunded for years. During the recession, there was divestment, and [prior to this year] we hadn't seen a reinvestment since the recession. Since 2010, there had been about $1 billion in cuts to human services across the state," Jackson said. "I think there’s a misperception that people who work for nonprofits do it as volunteer work - these are crucial services that government is not providing, that they have contracted out to nonprofits," Jackson explained. "Looking at state and city cost of living adjustments over the last few years up until this year, human services workers have been forgotten about. We’re about 15 percent of the state’s workforce, and it's the government’s job to make sure that human services workers are compensated fairly because they are employed through contracts." These human services workers provide a range of critical programs to some of the city’s most vulnerable populations, including in foster care, senior services, early childhood education, after-school programs, homeless shelters, job training and placement, and community health services. Nonprofit organizations on human services contracts delivered about $2.3 billion in services to New York City in fiscal 2015, according to the Mayor’s Office of Contract Services. On Monday, November 2, the City Council Committee on Contracts, in conjunction with the Committee on Community Development, will hold an oversight hearing to evaluate the administration's progress in implementing the policy change and allocating funding for the wage floor and the cost of living adjustment. Although the mayor set aside a certain amount of money in the budget to pay for the wage adjustments, Rosenthal explained, "the budget did not dictate exactly which agencies and which contracts and which programs would get that pay increase. So, it's my understanding that what's been happening over the last three or four months is that city has been collecting information from contract service providers about the workers they have, the titles, and how much they’re currently being paid in order to now allocate the lump sum of money to the specific agencies." Allocating the funds can be a complicated process, given that in Fiscal Year 2015, eight City agencies, including the Department of Youth and Community Development, the Administration for Children's Services, and the Department of Homeless Services, registered 16,524 contract actions, according to the Mayor’s Office of Contract Services. In the human services industry, those contracts are awarded to vendors, predominantly nonprofits, for the purpose of providing programs such as day care, housing and shelter assistance, and counseling services. The 2.5 percent increase for approximately 35,000 of the city's 125,000 contracted human services workers and the wage floor for roughly 10,000 social services employees fall short of salary adjustments advocates were pushing for, but are still generally viewed as a significant step in the right direction. "It really is a crucial first step and shows a real commitment from the mayor in investing in human services workers," Jackson told Gotham Gazette. Going forward, human services advocates plan to push for continued investment into the sector. "We want to see the cost of living adjustment systematized so it's not the case that every five years, groups have to advocate for one," Jackson said, "there should be consistency in how cost-of-living adjustments are applied for nonprofits." Rosenthal said she also hopes the hearing will "help to give us a sense of how much money it would cost to get these workers up to $15 an hour. As we understand that, we can start to advocate for that increase in the budget for next year - I think we'll learn a lot more about the details of getting us there from this hearing." Governor Andrew Cuomo has recently come out in support of a statewide $15 hourly minimum wage for all workers, calling for the wage to be phased in by 2019 in New York City and by 2021 across the state. The move is part of a nationwide push to raise the minimum wage, as cities like Seattle ($15 by 2021), Los Angeles ($15 by 2020), San Francisco ($15 by 2018), and Chicago ($13 by 2019) have passed legislation to phase in a minimum wage increase. Just last week, Syracuse Mayor Stephanie Miner increased the minimum wage for the city's employees to $15 an hour. The raise affects about 69 employees, including laborers and information aides, some of whom had previously made as little as $8.75 an hour (the state’s current minimum wage), The New York Times reported. Some have wondered why Cuomo, who said during his minimum wage announcement last month, “every working man and woman in the state of New York deserves $15 an hour as a minimum wage,” doesn’t lead the way by raising the wages of state employees, more than 15,000 of whom make less than $15 an hour living wage, according to a New York Post review of records kept by State Comptroller Tom DiNapoli’s office. There is room to ask the same of de Blasio with those on the city payroll or working through city contracts. Though the human service nonprofit sector would indeed be affected by a statewide minimum wage increase, Jackson told Gotham Gazette, nonprofits under contract with the government would need more funding in order to pay their employees higher wages since, unlike businesses, human service nonprofits cannot simply raise the price of their services to cover the costs of paying their employees more. "We would need the increase to be covered in contracts. The government would need to pay that," Jackson said, explaining that when Mayor de Blasio wanted human services workers to have a higher wage floor, for example, he increased funding for contracts in order to pay for that increase. Raising the wages of human services workers by increasing funding in the human service nonprofit sector would contribute to the city’s efforts to reduce homelessness and inequality, since outreach programs, supportive housing, drop-in centers, and other programs are more successful with greater consistency and quality of service.